“If you’re looking to buy a new vehicle that’s going to hold its value, bolder may be better. o The Fiat brand’s 60-second ad, “The Fiat 500X Blue Pill,” placed third among all commercials aired during Sunday night’s Super Bowl telecast, in USA Today’s Ad Meter consumer panel voting. The Dodge brand ad, “Wisdom,” placed sixth, and the 90-second Jeep brand ad – a scenic world tour to the song “This Land is Your Land,” placed 15th among more than 65 ads aired during the broadcast, USA Today reported. For the 27th consecutive year, USA TODAY’s Ad Meter’s consumer panel has rated the Super Bowl commercials. From across the USA, an online audience of more than 20,000 registered panelists voted on the commercials, the paper said. This link takes you right to the Jeep website to start building your own Renegade! The all new Jeep Renegade is just around the corner. Current estimates put the Renegade on showroom floors starting as early as March! 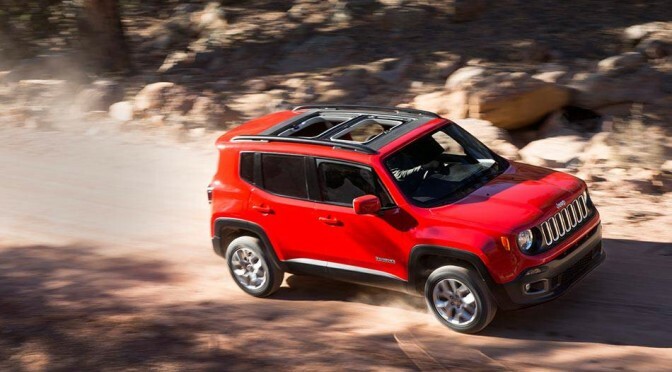 o The new 2015 Jeep® Renegade aims to bring the Jeep brand’s off-road reputation to a new segment, at a new price point, the Toronto Star said. The Renegade has off-road capability equivalent to other Jeep products, but it also had to provide on-road comfort, easy handling, good fuel consumption and all the amenities urban customers expect, the Star said. The on-road side of the equation is covered with independent strut suspension at both ends to soak up the big bumps and provide rapid-fire response, the article said. Similar-sized, -priced and -specced vehicles don’t have the off-road cred: All of those would kill to have the image that Renegade gains from its Jeep heritage, the Star said.